Photo: Trombley House, ca. 1836, Veterans Memorial Park, Bay City, MI. Listed on the National Register of Historic Places in 1973. Photographed by user:Andrew Jameson (own work), 2012, [cc-by-3.0 (creativecommons.org/licenses/by/3.0)], via Wikimedia Commons, accessed April, 2014. Bay County administrative offices are located at 515 Center Avenue, Bay City, MI 48708; phone: 989-895-4130. Bay County was created in 1857. Its two main rivers are the Kawkawkub and the Saginaw. 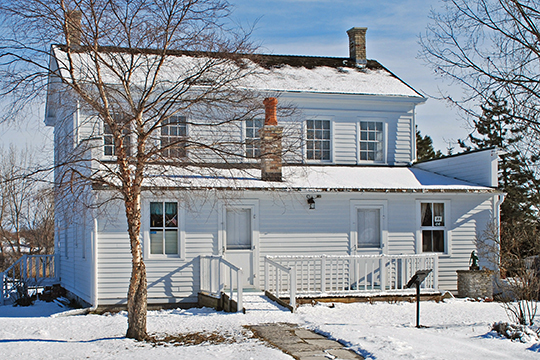 The county seat, Bay City (originally known as Lower Saginaw), had its beginnings as a trading post in 1832 when Leon Trombley migrated from Detroit, having been commissioned to instruct the Sauk Indians in agricultural methods. The name was changed to Bay City in 1857 and was incorporated as a village in 1859.